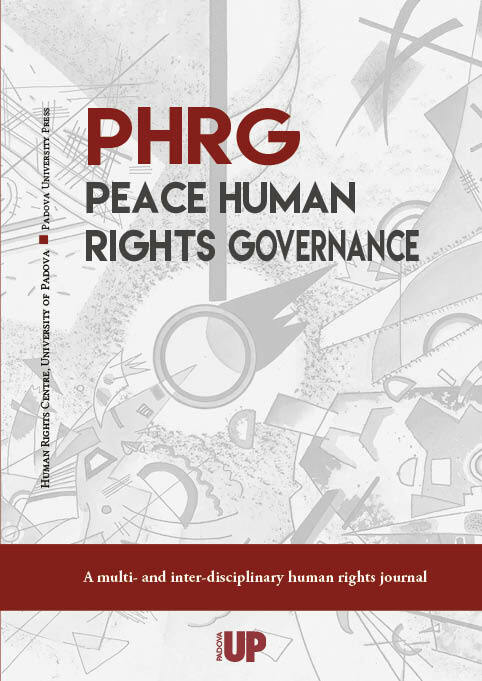 PHRG is an open access journal that publishes original peer-reviewed research papers on Peace, Human Rights, International Relations and Governance issues, favouring the development of a solid multi- and inter-disciplinary, and multi-level approach to human rights scholarship. The ethic statements of PHRG concerning the duties of the editors are based on the 2011 version of the Code of Conduct and Best Practice Guidelines for Journal Editors of the Committee on Publication Ethics. The editors actively work to improve the quality of PHRG and are responsible for deciding which of the papers submitted should be published or not, evaluating manuscripts for their intellectual/scientific content without regard to race, gender, sexual orientation, religious belief, ethnic origin, citizenship, or political orientation of the authors. PHRG follows a double-blind review process, whereby authors do not know reviewers and vice versa. The editors are responsible for securing timely, independent and anonymous peer review from suitably qualified reviewers who have no disqualifying competing interests, of all manuscripts submitted to the journal. The editors are responsible for ensuring that the journal has access to an adequate number of competent reviewers. The editors and the editorial board must not disclose any information about a submitted manuscript to anyone other than the corresponding author, reviewers, potential reviewers, other editorial advisors, and the publisher. Unpublished materials disclosed in a submitted manuscript must not be used by editors without the express written consent of the author. Authors must ensure that no part of their work is copied from any other work, either authored by themselves or others and that the work is original and has not previously been published in whole or substantial part. The author should not submit concurrent manuscripts (or manuscripts essentially describing the same subject matter) to multiple journals. If applicable, the author must demonstrate that its articles has met fundamental ethical issues (including informed consent for interviews). Authorship should be limited to those who have made a significant contribution to conception, design, execution or interpretation of the reported study. Others who have made significant contribution must be listed as co-authors. The author should ensure that all co-authors have affirmed the final version of the paper and have agreed on its final publication. All work in the manuscript should be free of any plagiarism, falsification, fabrications, or omission of significant material. Plagiarism and self-plagiarism constitute unethical publishing behavior and are unacceptable. PHRG reserves the right to evaluate issues of plagiarism and redundancy on a case-by-case basis. The author should indicate explicitly all sources that have supported the research and also declare any conflict(s) of interest. The author should provide raw data related to their manuscript for editorial review and must retain such data. Authors should be prompt with their manuscript revisions. If an author cannot meet the deadline given, the author should contact the PHRG managing editor as soon as possible to determine whether a longer time period or withdrawal from the review process should be chosen. The author should promptly inform the editor/guest editor(s) of any obvious/significant error(s) in his or her published paper and cooperate earnestly with the editor-in-chief in retraction or correction of the paper. If the editor-in-chief is notified by any party other than the author that the published paper contains an obvious error, the author should write a retraction or make the correction based on the medium of publication.